Anyone who knows me knows that cooking ain't my thing. My motto: "Why waste time cooking when you can eat it right out of the box?" Fewer dishes to wash that way as well. 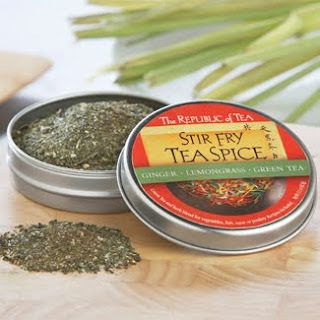 That's one of the reasons I was so eager to try out the new Stir Fry Tea Spice from Republic of Tea. A mix of ginger, lemongrass, organic gunpowder tea, parsley, white pepper, garlic powder and a touch of sugar, the Stir Fry Tea Spice is a quick and easy way to add a bit of pizazz to a meal. I sprinkled a bit in a chicken stir fry to zest things up a bit, but it works just as well sprinkled on a chicken breast or piece of salmon and then baked in the oven. A little more work than just opening up a box, but not much more. The spice mix is also good for you as green tea helps to lower cholesterol and is high in vitamins, minerals and antioxidants. Although I do cook, that sounds yummy. C and I have discovered Nomo "egyptian dukkah", a combination of nuts and spices, mostly cumin. It smells *wonderful* by itself and can be used on fresh or baked dishes. I had some on pasta the other day and it really made the dish.